PRF BBQ Louisville, KY 2016 will be held Sept 1-4. 60 bands, 4 days, 3 venues. Visit prfbbqlou.com for more info. 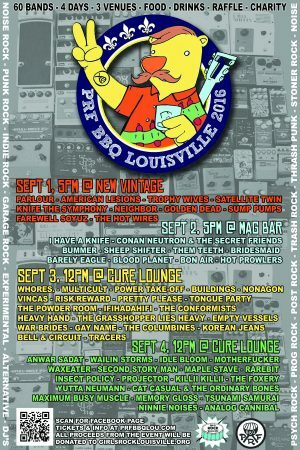 The PRFBBQ returns to Louisville, KY Sept 1-4 over Labor Day weekend and its going to be quite the banger! This one is not to be missed. With heaps of PRFBBQ mainstays like Nonagon, Risk/Reward, The Columbines, and The Conformists, along with noise rock heavies WHORES., Multicult, Buildings, Bummer, power take-Off, sprinkled with awesome Louisville locals like Anwar Sadat, Parlour, Waxeater, Trophy Wives; the event is shaping up to “unfuckwithable”. 60 bands, 3 venues, 4 days, food, drinks, charity raffle, sweat, hugs. Get your tickets early at prfbbqlou.com or use the PayPal button below.